Pre heat the oven to 200. Roll out the pastry and cut into 4 rectangles. Place on a flat oven tray and place in the fridge for 10 minutes. Cut the peppers into strips. 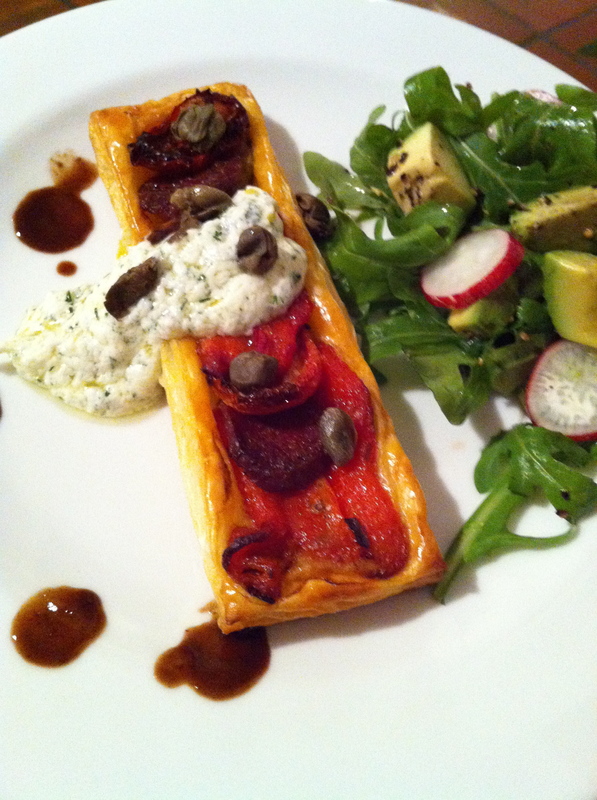 Arrange the peppers and the chorizo onto the pastry, interleaving them. Add the sun dried tomato as well if using. Once complete sprinkle capers on top. Bake for 20 minutes. Combine the labneh or cream cheese with the zest, lemon juice and dill and mix well. Remove tarts from the oven and place on individual plates. Dot with basil pesto and a dollop of the labneh mixture and serve with a rocket and avo salad.